Some thoughts about records. Chosen at random from my box of vinyl in the attic. And maybe other stuff from time to time. Whatever happened to Danny Wilson (I’ll ignore any answers involving the current Sheffield United manager who took Barnsley FC to the Premier League in 1996)? Named after a Frank Sinatra character and saddled with the label “sophisticated pop” (see also ABC, Pet Shop Boys, etc) Danny Wilson’s short career can be remembered for, well not this record apparently. And I think it’s their best. The band came to the attention of UK (sophisticated) pop fans after the umpteenth re-release of Mary’s Prayer, a charming song which surprised everybody by troubling the US Billboard Top 30 in 1988. Thanks to that success it became a big hit in the UK, no doubt confusing Smashy & Nicey when Danny Wilson turned out to be three people (Gary Clark, Kit Clark and Ged Grimes) and not a journeyman footballer who’d just won the League Cup with Luton Town (see – I really do my research – they beat Arsenal 3-2). Second Summer of Love, released the following year and leading their second album (Bebop Moptop), has that Del Amitri/Hothouse Flowers thing going on that was so popular at the time. Plenty of acoustic guitars and mandolin high in the mix, a harmonica in the middle eight. All earthy. Organic even. And all of which is in stark contrast to the actual Second Summer of Love (copyright NME, Melody Maker, etc, etc), a time marked by the rise of acid house, warehouse raves, beats, bleeps, squeaks and other E-fuelled revelry. Acid on the brain indeed. I can never quite work out whether Danny Wilson are taking the piss or celebrating the Second Summer of Love with this song. I think it’s possibly the former – pointing out that The first summer of love was clearly just a summer long is perhaps a “they’ll never learn” shrug of shoulders and we’d all be back to normal next year. We were (sort of). And all those references to acid. Well, there was a fair bit of it about and it’s widely acknowledged there wouldn’t have been the scene without it. Meanwhile, fellow sophisto-pop (copyright me, just now) band ABC had a different take on the whole thing. Ditching the suits and donning the love beads they embraced it whole heartedly, devoting a whole album to the loved-up vibe with Up. Massive fan as I am of ABC, this era never sat comfortably with me, with Martin Fry coming across as an uncomfortable trendy Dad in the video to One Better World. Nevertheless, I love this Second Summer of Love. I still play it a lot. It makes me smile. I love the mandolin, which beat REM to the punch by 3 years. And I’m a sucker for a harmonica solo (wait til I find my copy of There Must Be an Angel). 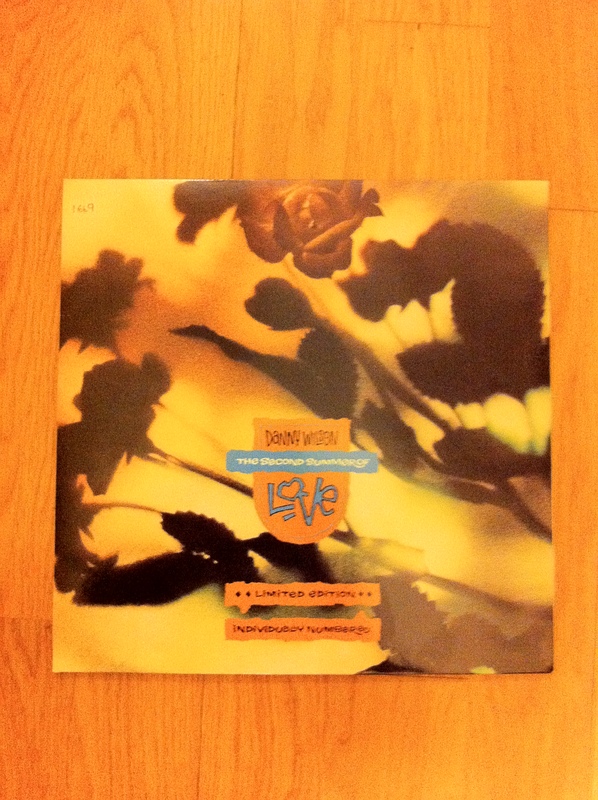 My copy is a limited edition 10″ gatefold sleeve (what is it with me and gatefolds?). It’s limited edition no.1669. I know that because it’s “individually numbered” (written in biro) on the top left hand corner where it looks a like a sticker or pressing should be. So what did happen to Danny Wilson? They were to release one further album but did not enjoy anywhere near the success, splitting up in 1991 and becoming US based writers-for-hire or playing bass for Simple Minds. Enter your email address to follow Record at Random and receive notifications of new posts by email. Follow Record at Random now! Music. Video Games. Hockey. Television. Whatever.